In late 2010 I wrote a blog post about how Facebook could easily be worth $100B. Some of my colleagues called me up and did nothing short but claim that I must be crazy. That’s perfectly fine. I have a feeling that I’m going to get even more calls about this post. My rationale isn’t built up from an analyst’s financial model or from leveraging traditional market sizing techniques, it’s mostly based on intuition about how Facebook can become the key player in the world of Online marketing and advertising. Google is the leader in performance and direct response advertising, converting users wants and needs to e-commerce transactions and sales leads. Facebook competes with Google on direct response and is becoming more and more effective in doing so by leveraging the Social and user’s click-stream data, capturing a growing portion of Google’s market. However, Facebook’s untapped potential is actually in brand advertising, a space that currently has no clear winner and will account for almost half of total online advertising spending in 2015, according to e-marketer. Brands already get it and are willing to pay; But Facebook hasn’t yet found the right model to fully incorporate them. The value of positive engagements between consumers and brands shared across the social space is hard to match, and Facebook will find ways to scale the monetization of that on facebook.com across fan pages, ads and the newsfeed. Analysts focus on revenues from ads delivered on Facebook.com, and Facebook has just started maximizing its potential there, but Facebook has not yet turned to monetize one of its greatest assets – the Open Graph. Hundreds of millions of users are using Facebook’s open graph capabilities across million of websites (including most of the top sites in the world). More than 10,000 sites are adding the Open Graph capabilities each month. “Login with Facebook” is no longer an option – it’s a must. Additionally, Facebook captures endless piles of data about people, their lives, and their friends. Think a lifetime worth of data and then multiple that by over 800 million users. Big Data indeed. This staggering amount of data will enable Facebook to deliver ad targeting capabilities which are unparalleled, optimizing performance and accuracy better than any marketing tool seen before. Whether this happens or not depends mostly on execution, not on the conceptual capability to deliver those tools. The data is there. This all leads to Facebook having a unique opportunity to create an unparalleled display ad network outside of Facebook, adding social targeting to help drive up revenues. With this strategy, there is no reason why Facebook can’t control the same portion of the market in online branding as Google does with direct response. Facebook can eventually match Google ad revenues with a combination of brand and direct response ad products, inside Facebook.com and in many leading destination sites outside of Facebook. With other revenue streams, such as payments for virtual goods, Facebook can even outpace Google. Compared to Google, Facebook’s business is potentially more defendable. In Search, Google dominance is driven by excellence in monetization, a powerful brand and great technology. However, Google does not “own” search, it just executes better than anybody else in the search world. as technology progresses Google’s tech advantage is becoming more incremental compared to some of its competitors, and can be potentially disrupted. It’s going to be crazy hard to disrupt Google, but it’s doable. Facebook is not in the same boat. Social is already an inherent, must-have, layer in everything online – websites, mobile apps and smart TVs. Facebook “owns” Social, and in its dominance is driven by a powerful network affect. Technology is not the key driver here. Many can potentially try to create a social network service that outperforms or delivers more features than Facebook does, but it doesn’t really matter. What matters is that all your friends are on Facebook. At this point in time, Disrupting Facebook requires more than a just better tech or flawless execution. It requires a paradigm shift to a whole new era of online computing, and even there it’s pretty safe to assume that Facebook will be all over the place. So, whether it takes 12 month or 5 years, it’s pretty much inevitable – Facebook, as mission critical piece of our connected identity stack, will increasingly find ways to monetize its position and would be worth more than Google today at $200B. This entry was posted in marketing, Social Media, Social Networks, Web on March 11, 2012 by Itamar Novick. This post is a guest post – an open letter to Facebook – written by a good friend, Guy Azar (http://il.linkedin.com/in/guyazar). Guy has been working hard to build a business on top of Facebook, helping brands promote themselves on the platform. Facebook significant changes to fan page platform, soon to take full effect on March 30, literally made the fan page as commercially effective as a personal profile. Many existing connection, engagement tools and techniques have become obsolete as a result. Most providers will take weeks to months to restore the usability of their products & services, and achieve partial effectiveness, at best, in continuing to promote their brands and customers. This excludes, off course, the inner circle of providers such as Buddy media, Involver and others who were in on the hot details well in advance, just enough to be ready on time. This is the classic move of the platform player: every once in a while making a few smart changes, which gradually snuff out revenues from the echo-system and further empowering platform revenues. Day by day this is causing fan page developers to clearly understand that we will never be able to build a big business on top of Facebook in the long run. Once our business is big enough, the platform will make changes, leaving us, the echo systems inhabitants, with just enough revenue to keep going. Facebook knows that the true long term goals are beyond connecting a brand to a person. They wish to function as the main personal history and ID source for each and every one of us. This is their long term goal and its implications are beyond Economical. The vision they will only be realized by fiercely defending user privacy and provisioning commercial actions. They are life changing, and the vast economical sides effects of this future are more than beneficial. But the long path is jeweled with many financial challenges. Social media value is proven for corporations, mainly in Marketing: branding, accelerated buzz \ WOM generation, lead generation, customer relations and support, engagement, satisfaction, churn indicators, all decreasing CPA or increasing LTV in some way or another. However, it seems as if the social media monetizable values are NOT clear for the social media platform itself. Facebook latest move is, from my point of view, a BIG signal to developers. A big question mark. That question should be reflected back at Facebook – “What is our business model with brands?” and it’s derived from the more basic question mentioned above: “what function in people’s lives does Facebook fulfill?” and “what commercial aspects of people’s lives do we intend to facilitate?”. Facebook should moderate every commercial act over its platform, But they can contribute to the creation of the ethical, legal, foundations of it, shifting some responsibility back to the Brands & businesses. Once it is acknowledged culturally and legally that brands and businesses are responsible for their use of their user’s personal information. So what will it be? Why can’t Facebook charge businesses for their commercial presence and activity? Facebook has the means to measure the connection, engagement and actions users perform with brands and businesses. With so many valid indicators, why can’t those indicators serve as the pricing and business model for brands and businesses on Facebook? it makes sense – presence itself could to be billed for. With that model Facebook will be better aligned with it’s developres echo system, effective leveling the playfield by letting any developer share revenues with Facebook when their bring brands that engage with users on Facebook. To summarize, as a fan page builder I am very disappointed with Facebook. letting the providers take the fall for their monetizing challenges. Instead they could come up with a vision in which presence, connection, and engagement indicators will function as billing meters. That could provide us the liberty to go back to the work with relevant customers who are interested in engaging users at a brand’s fan page, deliver a special customer experience, exclusive information, opportunities and offers, and share them with the brand and with fellow customers. This entry was posted in Israel, marketing, Social Media, Social Networks, Web on February 27, 2012 by Itamar Novick. Social Gambling (i.e. Zynga Texas-Holdem Poker, the world’s largest poker site of any kind) has been around for years now with virtual currency, but only recently has the media picked-up this theme and started playing around with it, drawing parallels to social gaming, and suggesting the Zynga might actually switch to real currency. Investors and corporates, however, have been going back and forth with this for a while now and a few recent acquisitions in this space include Playtika and Double Down Interactive. Harrah’s, a unit of Caesar’s Entertainment Corporation, acquired 51% of social games developer Playtika Ltd. at a company value of $90 million. This acquisition is astonishing by almost every measure, as it is the largest acquisition of an Israeli online gaming company, and for a company that has been around for less than a year(!). Meanwhile, Double Down Interactive, creator of multi-game app Double Down Casino, was just bought by International Game Technologies in a deal worth up to $500 million. The potential in Social Gambling should come as no surprise to anyone. Gambling is inherently social (think about any casino game, other than maybe slot machines), and social gaming (i.e. Farmville) has much in common with gambling. One very good example of how close social gaming is to gambling, and how it basically triggers the same kind of brain reaction, was recently posted here. See if this sounds familiar to you: To play, you put currency into the game. You then pull the knob and wait for the result. When the result is presented, you are rewarded with a cacophony of exciting sounds, attention-grabbing images, and some form of currency. You also have the opportunity with each play to win a rare prize of significantly higher value than the value of the currency you contributed to play the game. That sounds a lot like a slot machine, right? Wrong. It’s the basic action loop in FarmVille. Here is the same description again, but this time, with FarmVille specific details: To plant a crop, you must first spend resources on the seeds. You then plant the seeds and must wait for them to grow. When you harvest the seeds, you are rewarded with a cacophony of exciting sounds, attention-grabbing images, and some resources. You also have the opportunity with each play to win a rare prize of significantly higher value than the seeds that you purchased. Couple that with the distribution channels available in Facebook and other Social Networks and here comes “Online Social Gambling”. Many online gambling sites have been dying to leverage the social customer acquisition channels for ages now, but have been barred by Facebook’s reluctance to approve gambling content, to avoid legal complication in the US. Those companies are more than willing to pour billions of dollars into customer acquisition in Facebook, just because they knew that they will optimize those acquisition channels to reach a rock-bottom customer acquisition cost. Social will also help drive stickiness and time spent, increasing the customer’s life-time-value in the game. This entry was posted in Israel, marketing, Social Media, Social Networks, Web on January 22, 2012 by Itamar Novick. Facebook’s recent product releases in F8 are potentially disruptive on multiple fronts and very exciting. My plan is to write a few short posts about the changes, and this first post is mostly about Timeline. Almost all of the changes announced reinforce Facebook’s strategy on increasing engagement, collecting more personal data, and extending the Open Graph platform outside Facebook. All of those changes will potentially enable Facebook to charge more advertising dollars in the future for letting brands access the Facebook user base. This one is a mix between 1000 memories and Myspace on steroids (especially with Facebook boxes back). Polishing profiles is a natural and irresistible behavior and back in the days Myspace (unintentionally) created an entire eco-system of profile enhancement, widgets and layouts around Myspace which drove a substantial part of the engagement there. Funny that it took Facebook sometime to realize why Myspace worked (until it stopped working…) – because people were busy grooming their profiles. A friend from Facebook mentioned that user activity analysis showed that peeking into profiles (Did anybody say stalking?) and tweaking one’s own profile are key user behaviors, so Facebook decided to further develop that. Stay tuned for additional vignettes on some of the other interesting features. This entry was posted in Social Media, Social Networks, Web on September 26, 2011 by Itamar Novick. Google+ launch – is it too late to rebuild the Social Graph? This week Google has made a bunch of Silicon Valley folks happy with the launch of Google+ and a slew of additional social and communication features (Huddle, Hangout and Sparks). It seems like the Social Network “war” is officially back on, and remarkable this is happening exactly on the same week that Facebook’s old Nemesis, Myspace, is finally put to rest. From a user experience perspective it seems that Google’s product is getting positive feedback. I personally like it and think that circles is just fun to play with and that the main Google stream component has a good clean user interface. The successful launch and Google’s reach across different products will surely help Google+ acquire users, but the real questions is not whether they will come if Google builds it, it’s whether they will stick around. The attention span of users is limited and people use both Facebook and twitter because they provide two pretty different communication channels. Google+, however, is just too similar to Facebook, so it can either steal that attention span from Facebook or bust. With user retention it seems that Vic Gundotra and Bradley Horowitz are right on the spot – it all comes down to how broken and awkward online sharing is, but for me there is one question that just keeps lingering out there – do people really care about that anymore? Facebook, with over 750 million users, has done an amazing job educating the masses that privacy is dead and surprisingly enough, it’s working. If privacy is really dead, do we really need walls between our friends and peers at work anymore? Do young professionals really care if their boss sees their pictures from last night when they were wasted? Maybe not so much – relationship both on the professional setting and on the personal level are getting more informal. Does a college undergrad care that his mother knows he was out all night with a random girl? yeah well, mom choose to befriend him on Facebook so that will teach good old mom a lesson. Talking to a few startups this week that are focused on professional social networks and data analytic on top of Facebook, it seems that the Facebook environment is increasingly becoming a professional communication channel. The thin line between a professional and personal networks is becoming increasingly thinner and people are grouping their personal and business connections together. One startup, FellowUp, a personal productivity tool that taps into social accounts, reports that its users (mostly professionals) are connecting to their Facebook account 50% more often than to their LinkedIn accounts, and are leveraging the Facebook connection to reach-out their peers and counterparts at work alongside their friends. With a good product out there, it remains to be seen whether Google is able to change users’ habits and make them switch to Google+, because people think that Social sharing on Facebook is broken and would rather share content on Google+ instead. It’s one philosophy vs. the other and may the best one win. Or at least that is the case on the web browsing front. But what about mobile? Facebook faces one additional risk from Google in the Mobile Social Networking space – Google has that mobile DNA with Android and can build on top of that. For example, what would happen if Google preloads Google+ into Android devices? 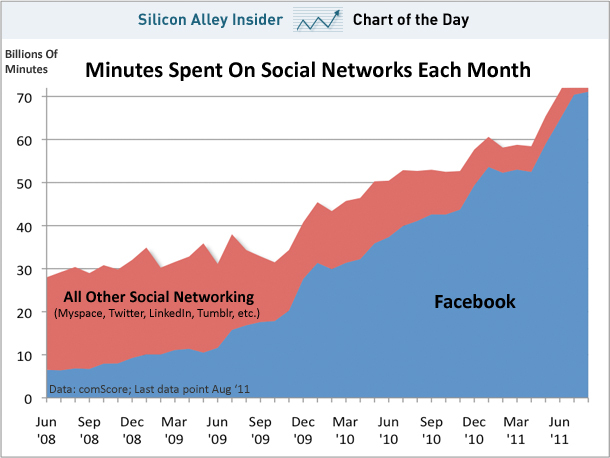 Facebook probably needs to get more serious about mobile, and fast. This entry was posted in Social Media, Social Networks, Web on July 1, 2011 by Itamar Novick. The action on the Twitter platform last week with UberMedia reminded me what platform play is all about. Talking to colleges, I was surprised to hear that some people think that UberMedia can “beat the platform” and create an off-Twitter network. Knowing first hand some of the developer policies that platforms like Facebook and Twitter put in place, it’s pretty easy to see that any of those platforms can shut down any service they want, whenever they want, without potentially having a reason. Off course, that can be a highly unpopular move that will result in bad PR and upset users, but if it’s “self defense” they can do it with a blink of an eye and might actually get away with it. Furthermore, even if the consequence of shutting down a company that is positioning itself as a competitor is some loss of users or a slight regression in adoption rate, that might be a small price to pay compared to the alternative. Personally, I think Twitter made the right move, they got worried that UberMedia controls such a large percentage of twitter’s user base, so they made UberMedia behaves sooner rather than later, before they have an even greater user reach. Twitter could have looked away and ignored it, but they decided to stop this madness right now, and make sure UberMedia remembers who controls this platform. As a nice side benefit, twitter also enjoyed two days of increased user adoption for their mobile and web tools because the redirected users that wanted to learn more about the outage to their own applications. Another recent example is an automatic algorithm used by Facebook to block application according to some criteria. Developer’s claim that Facebook is blocking application algorithmically that are growing “too fast”, regardless of whether they abuse Facebook’s developers policy. You can follow the conversation onQuora here. At the end of the day, companies building layers of services on top of those platforms need to understand the rules of the game, and realize that as long as everybody gets along it all good, but if something goes bad, the platform can always pull the trigger on them, at any time. “Developers have told us that they’d like more guidance from us about the best opportunities to build on Twitter. More specifically, developers ask us if they should build client apps that mimic or reproduce the mainstream Twitter consumer client experience. The answer is no,” Sarver writes very matter-of-factly. This entry was posted in Social Media, Social Networks, Web on March 1, 2011 by Itamar Novick. Is Facebook overvalued at $50 billion? Does Facebook valuation indicate that a Tech Bubble is build up? In the last week we’ve heard quite a few voices claiming that Facebook might be overvalued at $50 billion, and that a new bubble might be forming in tech sector (Here are a two – Economist – http://www.economist.com/economist-asks/facebook_overvalued_50_billion, Bloomberg – http://www.bloomberg.com/news/2011-01-27/facebook-overvalued-at-50-billion-in-global-poll-of-investors.html). There might be a Tech bubble out there, and I’m probably the last person that might have good insights on whether such a bubble exists or not, but I do think that adding Facebook to the mix and inferring that Facebook’s is overvalued might be wrong. It could be that there is Tech bubble and Facebook may still be truly worth $50 billion or more and there might not be a bubble and Facebook will still be worth that or much more. Over 250 million users use Facebook Connect each month. 10,000 sites are adding Facebook Connect each month and a total of over a million websites (including most of the top sites) are leveraging the connect technology today. Soon enough almost any site out there would have a “login with Facebook” option, and Facebook will have a staggering number of impressions outside Facebook.com. Facebook will be able leverage Facebook Connect to create a huge display and social ad network outside Facebook, adding profile and Social graph to the mix, as well as targeting and retargeting capabilities, to appeal to publisher to allocate more ad inventory to serve effective Social ds. Facebook’s key web metrics, such as Time spent, impressions, Unique visitors, and number of active monthly users are consistently growing and fast, while their main competition’s stats (Google and Yahoo) are either falling or standing still. Soon enough they will be the leader, by far, on any key metric. Facebook have not yet fully ramped up their ads in Facebook.com and are playing around with new ad units to try to deliver more value to advertisers. For example, the ad product they unveiled this week – Facebook sponsored stories (http://mashable.com/2011/01/25/facebook-sponsored-stories/) is another interesting attempt, a bit like Twitter’s promoted tweets, that might actually work. Facebook understands the importance of mobile and are heavily investing in it. They already have hundreds of millions of mobile users and coupled with a local strategy they will be a serious force in the mobile ad space. On top of that Facebook is pushing hard on other initiatives on their platform, such virtual currency and e-commerce. Their platform partners, such as Zynga, are virtually printing money today and it’s just a matter of time until Facebook figures out the right angle to claim their share of the revenues partners make on the platform. I feel we can expect them to create a steady and decent revenue stream from those initiatives. Finally, it seems that Social is an inherit layer in anything that is Web or Mobile, and that Facebook will dominate this space. If Social is everywhere and Facebook is Social, Facebook will be everywhere, just like Google is everywhere today. I would not be blown off my feet if two years from now Facebook and Google will be head-to-head in terms of Market Cap. 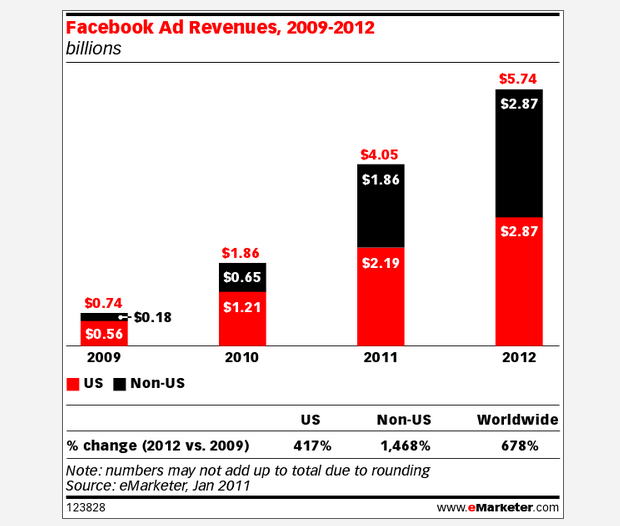 emarketer.com has recently published a forecast of Facebook ad revenues, expecting it to hit ~$4 Billion in 2011. This entry was posted in Social Media, Social Networks, Web on December 28, 2010 by Itamar Novick.